Daphnia (Daphnia pulex, moina, magna, or a hybrid) are small, mostly planktonic, crustaceans, between 0.2 and 5 mm in length depending on species. Daphnia are members of the order Cladocera, and are one of the several small aquatic crustaceans commonly called water fleas because of their jumping style (although fleas are insects and thus only very distantly related). They live in various aquatic environments ranging from acidic swamps to freshwater lakes, ponds, streams and rivers. In the aquarium hobby they are an important food source for small fish. You might find these sold live in pet shops in a sealed small bag. Ask the shop when they got them in as you don't want old stock which will contain dead animals which will foul the water. Live Daphnia may be purchased online. You might also find them from other local fish keepers who culture them. Check your local aquarium club to see if anyone has them. The nutrition of Daphnia varies largely on what the daphnia are fed. If the daphnia have an orangish color it can be assumed that they are high in beta carotene which can help improve the color of your fish. Paprika or pureed sweet potatoes can be fed to the Daphnia to improve their color. It's quite easy to breed this animal. Just supply a few litres of old tank water (Daphnia Magna 18-20°C (64.4-68°F) , Daphnia moina 20-28°C (68-82.4°F) with a pH of 7.5-9 (add 1 tsp of Bicarbonate of soda per 2 litres) and place in it an air line to ensure it is aerated. Do not use an airstone which produces ultrafine bubbles, like a wooden airstone. 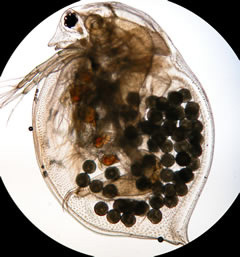 The tiny bubbles produced by an airstone can harm the Daphnia. A regular airstone will make larger bubbles which will be harmless to daphnia. The airstone is required to move the water and food particles around in the mid-column, so the daphnia can find them. Daphnia are not bottom feeders, their food must be free-floating and tiny enough to fit in their oral groove. 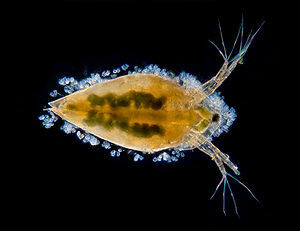 Daphnia feed on various groups of bacteria, yeast, microalgae (green water), detritus, and dissolved organic matter. 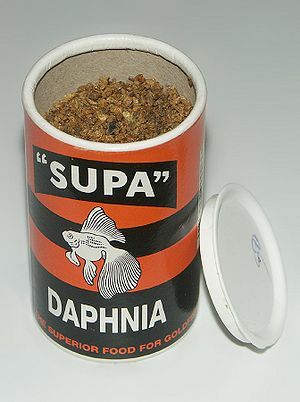 You can feed the daphnia fine powdered yeast or Spirulina as these animals are filter feeders. You can purchase algae pastes or make up your own food recipes as well. For best results, the container for daphnia should be funnel-shaped, i.e. narrow at the bottom, wide at the top. An inverted 19 Litres (5 US G.) water bottle works great. Some stores in the US sell these empty. You will need to perform weekly water changes of 25% otherwise ammonia levels in the water will kill your culture. If you are growing green water to feed daphnia, temperature is critical. The best temperature is 26.7-28.3°C (80-83°F) , with lots of bright light 14–16 hours per day. A halogen bulb is bright, and also gives off heat to heat the water. Keep a thermometer in the algae tank to make sure you have it at the right temperature. Use a turkey baster to feed the daphnia tank green water several times per day. It is said that keeping pond snails in with your daphnia can help produce food for daphnia from the snail's own waste. It has often been found that daphnia will put up with less-than-perfect conditions too. You can purchased Daphnia in the dry form. This is mature Daphnia which is dried and sold in small tubs. This food is cheap (typically £0.85 in the UK for a 70ml tub) and contains a high level of protein. Due to its collection process the dried daphnia may also contains a small level of other insects. This makes the food excellent for surface or insect feeders. Small fish like Neon tetras, Glowlights, White Cloud Mountain minnows, etc. seem to take to it readily. Typical food size is 1-3mm. Daphnia should only be fed every now and then to your fish because they can act as a laxative causing serious digestive problems. Plankton Culture Manual - An excellent book on culturing microalgae, rotifers, ciliates, Artemia and Daphnia. This is a "must have" book if you want to raise your own fish food. Great for both hobbyists and commercial fish farms. By Frank Hoff and Terry W. Snell. 1989. 126 pages. This page was last edited on 6 July 2018, at 12:28.